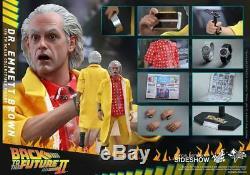 Hot Toys Limited Back to the Future BTTF II 1/6th Scale Marty and Doc Brown...... (Brand New) Few available in Australia. Hard and have become impossible to find in retail stores anywhere. In the classic sci-fi film Back to The Future Part II , the time-traveling duo Marty McFly and Dr. Emmett Brown has gone to the future - 2015 - in order to save Marty's future son from disaster. The film's representation of the year 2015 has been the favourite moment for many fans of the movie, and Sideshow and Hot Toys are very excited to officially present the all-new sixth scale collectible figure of Marty based on his memorable future look in the Back to The Future sequel! The movie-accurate collectible figure is specially crafted based on the image of Michael J. Fox as Marty McFly in his 2015 outfit in the film. 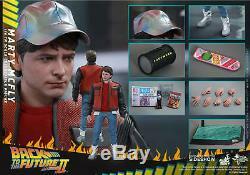 The figure features a newly developed head sculpt, a meticulously tailored costume including the iconic futuristic running shoes, a selection of detailed accessories such as hoverboard, multi-colour cap, future soft drink bottle, a sports almanac, and a specially designed dynamic figure stand perfect for hoverboard skating poses. Fanatics surely cant pass up on the opportunity to have this wonderful collectible figure in your display! WHAT'S IN THE BOX for Marty? 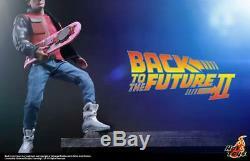 The Marty McFly Sixth Scale Collectible Figure specially features. A newly developed head sculpt with authentic and detailed likeness of Michael J. Fox as Marty McFly in Back to the Future Part II. Movie-accurate facial expression with detailed wrinkles and skin texture. One (1) interchangeable hair sculpture for wearing baseball cap. Body with over 30 points of articulation. Eight (8) pieces of interchangeable hands including: - One (1) pair of relaxed hands - One (1) pair of gripping hands - One (1) pair of hands for holding hoverboard - One (1) open right hand - One (1) partially clenched right hand. Each head sculpt is specially hand-painted. One (1) specially tailored red and black coloured jacket. One (1) pair of blue jeans. One (1) pair of grey and white coloured futuristic running shoes. One (1) multicolour baseball cap. One (1) shoes storage case. One (1) future soft drink bottle. One (1) sports almanac with plastic bag. Specially designed dynamic figure stand with character nameplate and the movie logo. WHATS IN THE BOX for Emmett? 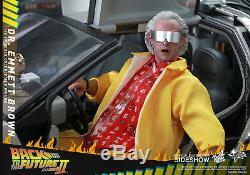 Emmett Brown Sixth Scale Collectible Figure specially features. A newly developed head sculpt with authentic and detailed likeness of Christopher Lloyd as Dr.
Emmett Brown in Back to the Future Part II. Four (4) pieces of interchangeable hands including: One (1) pair of relaxed hands One (1) pair of gripping hands. One (1) specially tailored patterned red shirt. One (1) specially tailored yellow coat. One (1) pair of yellow pants. One (1) pair of black boots. One (1) pair of silver sunglasses. One (1) pair of futuristic binoculars. Figure stand with character nameplate and the movie logo. Enjoy these very Rare Toys........................ The item "Hot Toys Back to the Future II (Brand New) Marty / Dr Emmett Figures 1/6th Scale" is in sale since Wednesday, August 1, 2018. This item is in the category "Toys, Hobbies\Action Figures\TV, Movie & Video Games". The seller is "the_bearbrick_and_kubrick_shop" and is located in SYDNEY, New South Wales. This item can be shipped worldwide.